In Ep. 055, Tim interviews Tony Bradshaw. Tony is the author of the recently released book ‘The Millionaire Choice’. The book hit shelves in late 2018 and helps let readers know that they too can become millionaires regardless of their background in life. Tony talks about making conscious choices and planning along the way to get to your goals, and why it’s important to change your financial mindset. Enjoy! SPECIAL OFFER for Living With Money Listeners! 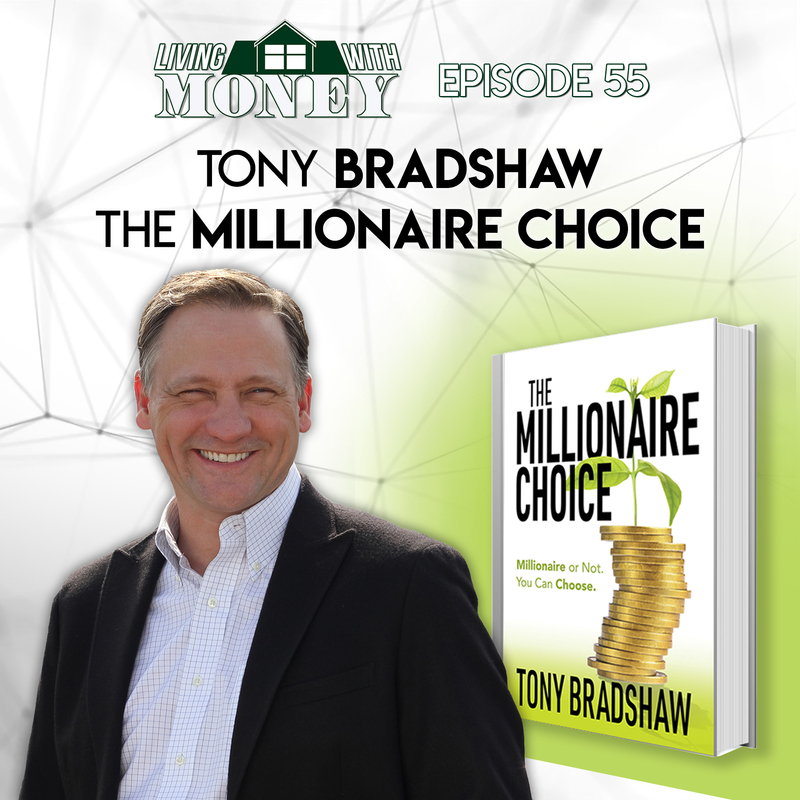 The Millionaire Choice by Tony Bradshaw – GET A COPY TODAY! Tim Mullooly: Welcome back to Living With Money. This is Tim Mullooly. On today’s episode, I am joined by Tony Bradshaw. Tony is the author of the book, The Millionaire Choice, published back in November of 2018. Tony, thanks for coming on the Podcast. Tony Bradshaw: Hey, thanks Tim for having me. I’ve enjoyed it. Tim Mullooly: Before we dive into the book, for the listeners, you want to just give us a quick background about yourself, how your career got going, and how you got to where you are today? Tony Bradshaw: I grew up in a lower, middle income kind of family. We didn’t have a lot of money. Really, my parents didn’t do a good job. I hate to say it that way, but didn’t really know how to manage money. A couple of things they did well, they sent me off to college and my mom encouraged me to stay in college when she told me how much rent I’d have to pay if I stayed home. So, I found it simpler possibly to go back to school when she was going to take half of the money I would be earning. Getting through college, getting out, an education, I actually started my career as an engineer, mechanical engineer, manufacturing engineer, and it was after I got my first W-2 as an engineer that I realized how badly I had managed my first year’s income. I had made about $39000 my first year, which is about four or five times money than I’d ever seen in my life and I was just shocked. My jaw dropped. I’m, “Wow. Where did all that money go?” And I looked around my studio bedroom apartment and I looked at my car that was financed out in the parking lot, driveway, and I was just like, “Wow.” That was a very short list. I had a very short list of assets after making $39000. That began my wake up journey on what to do with my money and my finances. So, I went to the book store, started learning about money, and then started investing. It took me about 90 days and I put together what I would call my millionaire plan. After that, it was six years of engineering, that I got into the financial space, financial education space as a digital business guy, built some online business models for a well-known financial education group and that was up until about 2016 and then now I’m on my own doing the same thing, but with a book. Tim Mullooly: Awesome. Just that personal experience and it’s like you said, making your own millionaire plan, is that what made you want to sit down and ultimately write the book, The Millionaire Choice? Tony Bradshaw: Sort of, yes. I think what happened to me is I was flying back and forth across the country, rebooting my career. I was in my 40s, 46 actually. I just started talking to more and more people on the airplanes and the restaurants at the airports, even friends and family members and I just realized how lost people were with their money. After 15 years with a financial education company, you get a little, I want to say isolated, because you feel like you’re making a difference. Everybody you’re talking to is learning about financial education, but when you get outside of that bubble, you start to realize how little people really know. Even though there’s a lot of good people doing a lot of good work with financial education, the job is just so big. There were just so many people that still don’t have access to the knowledge. I took what I had learned on my own journey to become a millionaire and packaged it up in a book and that was really my incentive. I just realized how many people needed it. And I would say, what even occurred to me more than that was there are definitely certain people groups, and I would say people in poverty that are really not getting the information and what I came to the conclusion was, is that all of the companies that are doing financial literacy, or financial training, or financial education, they’re all of these companies are designed to do what they’re supposed to do, which is create profit. But the reality is, you can’t make profit off the people in poverty because they don’t have any money. That’s why I feel like they’re neglected in the marketplace. That’s one of my goals with this book is to really reach into that poverty stricken area of America and really the world, but for right now, America, and try to reach them with the same information that the middle class and the wealthy people are actually getting. Tim Mullooly: Yeah. That’s a really good point. A lot of the education and advice that people get from traditional brokers and advisors, is geared towards people that already have money, not necessarily the people who don’t have money. That kind of segways nicely into the introduction of the book. There are some statistics about millionaires in America, is that why you decided to start the book with those statistics about how many people in America are actually millionaires? Tony Bradshaw: The reason I started with the statistics, and I agree with you, yes, is to try and give us a kind of a reality check. Tony Bradshaw: The home that I grew up in and even until the time that my mom passed away a couple years ago, they never grabbed hold of the concept or idea that they too could become millionaires. Even though I became a millionaire out of their household and their family, they never made the jump to understand that they themselves could become millionaires. That’s one of the reasons when you have the facts and the numbers, which a lot of the statistics are provided, were provided by Thomas Stanley and William Danko who wrote The Millionaire Next Door, and they did a good job of going out and finding the millionaires in America. These are just blue collar guys that are doing the work. These are just average everyday people that did the right things with their money. They made the right choices. As I said, The Millionaire Choice, a millionaire or not, you can choose, you’d have a choice on whether or not you could build wealth, it’s just you got to make that choice. And for me at 25 I made that choice. Other people make that choice at an earlier age and get there a little bit faster than I did. But, anybody can make that choice. And I think a lot of times Americans are trapped in this kind of perception, their own perception of what wealth is and I say that there are really two views on wealth. I think they’re wrong. Either you’ll never be wealthy, which a lot of Americans, that’s their vision, is “I can never be wealthy,” so to become a millionaire, I could never do that. Or, wealthy people are bad or wealthy is bad. And both of those are really lies. That’s really the reason why I wanted to put those statistics out there, to help people realize that they can do it. Anybody can do it. Tim Mullooly: Right. Yeah. One of the chapters in the book talks about learning what no one taught you. When it comes to our personal finance habits, and going back to what you said earlier about looking at your W-2, seeing how much money you made, and then wondering where it all went, I feel like that’s probably a very common occurrence for many Americans out there today. And people don’t really know that they’re using bad, less than optimal personal finance habits. Why do you think that it’s so important for these individuals to identify the habits that they have and learn to potentially break free of those habits that they’re using? Tony Bradshaw: Yeah. I think they’re all bad habits. I mean, I had bad habits til I was 26 and then I started changing, 25-26. But the problem is, a lot of people never understand that their habits are bad. They never had that, what I call financial awakening. Tony Bradshaw: I was pretty fortunate to have it in my mid-20s and then continue that throughout my life. My other family members really have never had that financial awakening. They’re stuck and I think that’s where a lot of Americans are. They’re stuck in these day to day bad financial habits. Tim Mullooly: Yeah. I mean, apart from reading a book like this, like the Millionaire Choice, how and when do you think we should, society, should start promoting these good financial habits and educating people properly? Cause right now it feels like there really isn’t that many ways that we’re educating people to establish good financial habits. Tony Bradshaw: The reality is, the structure’s not there. It’s just not in place. There’s some financial literacy laws and things that have been passed, but when you look at what was passed in the government and then what’s actually taking place, we’re really not where we need to be and so, I believe it’s two thirds of the states don’t have a formalized financial education, a financial literacy requirement. That’s just a very bad place for the country to be. I personally believe that we need to start in elementary school. Tony Bradshaw: With what’s right, age appropriate that they can grasp and understand. What I mean by that is, if you start very young, you’re going to bring it up. The way I think of it is, do you have a mentor or teacher to learn English? Yes. Do you have a mentor or teacher to learn math? Yes. Science, history. Those are all very important subjects, but I would say that financial literacy is as important as those, if not more important in some ways for the benefit and welfare of a person’s life. You always hear people say, “I don’t have to learn Algebra. I don’t need it for my life.” And the reality is, reality is, I have a daughter. I’ve got six kids. My daughter is horrible at math. And I’m like, “You know what? You don’t have to take math in college. You can take the subjects that matter to you that affect you and that you’re good at.” And financial literacy is one of those and we should start teaching it as early as possible. That’s one of my goals is to get this word out there and kind of really turn the industry upside down. I think even the financial education industry right now is kind of stuck. Everybody’s doing it the same way. It’s really going to take somebody coming in with an innovative spirit to turn things upside down, to really make a bigger impact, and I’m hoping to be one of those people. Tim Mullooly: Yeah. That’s a great point. Going back to that earlier question about breaking free of those bad habits. To your point, if we were to start teaching kids earlier about personal finance and establishing habits before they even get to establish bad habits, it would bypass that whole couple years where they establish the bad habits and just initially ingrain those good habits in their brain, right? Tim Mullooly: In the book you outline 10 keys of millionaires. The first key isn’t necessarily a financial key, but it’s more of a personal trait. Why did you choose to have the first key be to develop strong character for a person? When you look at what’s in the marketplace and the different leadership trainers and things like that, you really come back to character. The people who find success and actually build wealth, you’re going to find certain commonalities about them, some of it’s the way they handle money, but even deeper than that is their character and what they stand for. Integrity is one of those five character traits that I highlight, and when you look at the Harvard Business Review or any of these leadership type training, you’re always going to find character mentioned in those discussions as a huge piece of that success, how they build and establish their successes through character. If you ever jeopardize that integrity, well then, you jeopardize your business relationship, your family relationships. Everything falls apart if you don’t have that foundation to stand on. My parents were able to instill in me a very strong sense of work ethic, discipline, and focus. Those are the things that I think even beyond just learning about money, but that establish a person to be able to build well, they have to have those certain foundational elements. There are a lot of people out there that actually build wealth, but they don’t necessarily hang onto it. And when you look at why they lost their wealth, a lot times you’ll point back to the fact that they had failure in their character. Tim Mullooly: Yeah. That’s a good point. If you can be as smart as you want and learn as many good financial tricks and tips to make money, but if you don’t have the willpower or the conviction to stay disciplined like you’re saying, it’s not going to do you any good in terms of holding onto that wealth. Towards the end of the book, real life millionaires share some of their own stories for the readers. Do you want to talk a little bit about why you think it was important to include a piece for the readers from real life millionaires sharing their own stories? Tony Bradshaw: Yeah. I think a lot of the books, as I did research on my book and what I wanted to put out to kind of inspire people, I looked at a lot of different books and I realized that it’s a lot of authors telling their own story. I didn’t want to really be just another one of those authors, even though they’re great books out there. I really wanted to see what I could do differently to bring into the marketplace. It was very important for me to let other people share their own stories. Other people that have found levels of success, managed their money well, managed their lives well, but necessarily weren’t going to write their own book. I wanted to really give them to tell their own stories, that’s very important to me. But also, I wanted people to realize, it doesn’t matter where you come from, what color you are, what your ethnicity is, what your background is, that you can become a millionaire. That’s what I started to do is look for people that had accomplished the same thing but came from different walks of life and I was very pleased to see that when they actually shared their story and I went back and read through their stories, that it really affirmed what I was actually trying to teach in the book. I saw those elements come up in their own stories and that gave me a lot of affirmation. Basically, get everybody that made excuses for not becoming millionaires, to just erase those excuses. Tim Mullooly: Right. Yeah. I think it’s definitely good to show people that everyday people just like the readers can make it happen and if you actually apply what’s going on in the book, you can make that happen for yourself and people just like you are doing the same thing out there. I definitely think that that’s a good thing to include in a book like this. When it comes to achieving millionaire status, obviously people think that it’s sometimes all about the money. Would you say that there are any factors other than money that are absolutely crucial to someone becoming a millionaire? Tony Bradshaw: Yeah. We talked about character. That’s a big one, obviously. But I think even alongside character, is just as important, it comes back to time management. What are you doing with your time? Unfortunately, most Americans are not doing good things with their time. And I’ve been guilty of that. I was fortunate in my lifetime to waste a lot of time. I wasn’t fortunate to waste it, though, I was fortunate to redeem enough of it to actually find success. Even though I could look back and go, “Wow, I spent a lot of time going to movies and entertainment.” That was a big, what I call a time waster in my own life. Watching television or Netflix. When Netflix first came out, you’re sending DVD’s to the house and I remember my whole mindset was, I want to get as much value out of Netflix as I can get. Tony Bradshaw: As soon as a DVD hit the door, I’m staying up late watching that DVD. I’m sending it back the very next day and I’m maximizing my returns on my Netflix investment. But at the same time, I’m sucking up all my time that I could be using to build prosperity for my life. Tony Bradshaw: Eventually, I got out of that cycle, but it persisted for probably six months to nine months before I finally broke it. Your time management is a huge thing. Statistically, the average American spends about 120 plus hours per month watching television. That’s a full time job. That’s a full time job. Back when I started doing my own money journey, I remember when AOL, American Online was big and I went to a few AOL lunches here in Nashville, and I met a young lady and she was spending 40 hours a week on America Online. And my jaw dropped, because, I’m going … but that’s what America is doing. When we should be putting our efforts into investing ourselves in knowledge and growth and application so that we can have prosperity, we’re wasting it. Obviously with young … I’m dealing with this with my own children a little bit, is video gaming. I let one of my young sons get into gaming a little too often. I was a gamer. I have to really manage that for him, because he’s not capable of managing on his own. Those are just some of the things. Time management is huge. But having a plan too. You could say once you learn about money, you have to put it into a plan. A lot of people can learn about money, but they don’t necessarily put it into a plan. That’s one of my gripes with financial planners. A lot of times you hear this number thrown around, invest 15% of your income into retirement. Well, I don’t like percentages. They’re not an absolute number. That’s a variable number. If you’re making $50000 a year and you put 15% into retirement, it’s not going to amount to a whole lot. Tony Bradshaw: I really want to get people out of this money mindset and into this self-growth mindset to where they’re investing in themselves and making themselves more valuable, which will drive up their income. Then bring all that together into some kind of plan. So you know your character, your time management, and your financial kind of plan, and that’s what I call the millionaire plan. You need to have a millionaire plan. When are you going to cross that threshold? Tim Mullooly: Absolutely. I mean, I couldn’t agree more in terms of having an actual plan. Otherwise, it’s more just hypothetical wants like, I would love to become a millionaire. But if you actually have a written plan, a game plan, step by step, how you’re going to get there. It actually feels more tangible and achievable. Same thing with the time management as well. You can plan out your time and it shows how much you are, like you were saying, using on video games or Netflix, stuff like that. You often hear people say, “There aren’t enough hours in the day,” which is not necessarily true, it just depends on how you choose to use it. Tony Bradshaw: Yeah. I tell my family, whenever I hear somebody tell me they don’t have time in my own house, and I stop making excuses for myself. I just … I firmly believe this. You always find time to do what you want to do. It’s just, that’s the rule. That’s the rule that you, part of your life. And then everything else is an excuse to keep you from your own things. I think people need to wake up because for me, money’s a math problem. When you talk about, “Oh, I plan to become a millionaire. That sounds great. But it’s pie in the sky.” It’s really not. It’s just math. That’s one of the things that really helped me turn the corner in my 20s, is because I had to study a lot of math as an engineer. Cal one. Cal two. Cal three. All those things. When the light bulb came on, I just realized after I studied money for 90 days, money is just a math problem. There are laws that apply to it just like anything else and that you get, if you add two plus two you get four. Money is much the same way. Tim Mullooly: Exactly. And that’s, like you’re saying, it’s just a math problem, but that’s where that character comes in. You need to have the discipline to actually stick with the plan to make the math problems work out for you, right? Tony Bradshaw: Absolutely. Yeah. That’s a great point your making. Tim Mullooly: It kind of all ties in there, you know? You need to manage your time correctly. You need to make a plan. But then you actually need to have the willpower to stick with the plan. And, if you have all three of those, then, you’re on your way. We touched on a little bit before, you mentioned it, everyone comes from a different background and a different upbringing. You mentioned early in the book and earlier in the episode, you came from a kind of financially messy home. Do you want to talk about how people can kind of escape potentially messy family situation? Tony Bradshaw: Yeah. I mean, everybody’s situation’s going to be a little bit different, right? And I’m learning that as I work with different people and people groups. I’ve got my family situation, which are the lower, middle class income, but how do you get out of that? The first step is to realize you’re in control of your own life. You have to take responsibility for it. When I had my wake up call, nobody made those bad financial decisions but me. I’m the one that spent the money. I’m the one that went to the Burger Kings and Taco Bell every single day. The list goes on with the waste that I created. But you really need to start taking responsibility for it and just realize that for the most part, education’s your primary way out. If I had to say what’s the first step, is to take responsibility, to realize you have the potential. And then, go learn. Start learning. I was pretty fortunate because I had a life background of actually being a very inquisitive child, a very curious. I would educate myself through magazines. I wanted to learn how to fish and where my mother worked we had fishing magazines. I started reading fishing magazines and before long I was teaching the neighborhood kids how to fish for bass. After that it was cars. How do you rebuild a car engine? By the time I was 15, I had rebuilt my own engine in my own car that I’d purchased. I learned all that through magazines and reading. I was self-educated, taught. But, you do the same thing. The resources are out there. They’re everywhere. Everyone has access to this material and information. You just have to make an effort to go do it and stop listening to people that don’t know anything about money. If you want to be a millionaire, don’t listen to people that are not millionaires. Living With Money is a great resource for people who want to do that. Listeners have a great mentor in you, for bringing you speakers, listeners and podcasters, to kind of disseminate this information, get it out. That’s how you escape the messy financial situation, you just keep learning about money and applying it. That’s one of the things I talk about in the book too is, you want to get money smart. My book, I would consider it, not a primer book, but a good foundational book. But you shouldn’t stop with one book. You should continue that lifelong journey for as long as you’re alive. Tim Mullooly: Yeah. That’s a really good point. The learning never stops. There’s always new things coming out. Even if you think you know everything about money, there’s always new things coming out and ways you can improve yourself and I definitely agree with what you said about, if you want to be a millionaire, don’t listen to people who aren’t millionaires. That kind of ties back to establishing those bad habits when it comes to personal finance. You kind of, if you’re learning from someone who’s potentially not at the level of financial prowess that you would like to be at, it’s a good way to kind of slip into some bad habits, whether it’s intentional or unintentional. Tony Bradshaw: Yeah. And I would add onto that too. I’m not a genius. Tim Mullooly: Right. Me either. Tony Bradshaw: Guys that made bad decisions as somebody else, and I could show you dozens of financial mistakes that I’ve made along the way. But, seeking somebody that’s smarter than you, I probably went, if I’m being honest, I went more the self-directive route, the do it yourself route, because that’s how I’m wired. But, looking back over the last 15-20 years, I would’ve been much better off, had I had a day to day, what I call money mentor in my life that I could at least talk to and converse with. Tony Bradshaw: They won’t have all the answers, but they’re going to help me identify areas that I would’ve otherwise made mistakes in. I could’ve avoided some of the pitfalls. Tim Mullooly: That kind of bridges the gap nicely to my next question about money mentors or advisors. Do you think everyone should work with someone to kind of help them guide them along the way and just being able to talk with someone about your money? Would you say that’s the biggest benefit of having one of those money mentors? Tony Bradshaw: Yeah. I mean, I would say they’re indispensable. I thought I did a good job until I started looking at some of the mistakes I made and I’ve established a nice net worth and I plan to continue growing that, but, I could point to half a million dollar mistakes that I made. Tony Bradshaw: Looking back, half a million dollars by the time I’m at retirement age, and those are not small mistakes and I do believe that if I would’ve had a solid money mentor in my life, and had a plan to sit down with them and kind of review things, it’s kind of like grading papers, right? Tony Bradshaw: A lot of financial advisors are going to just tell you to stick all your money in the stock market. Why are they doing that? Cause that’s how they make money. Tony Bradshaw: They’re going to tell you what to do and it’s what they know. It’s what they’ve been trained on. The reality is, there are more ways to make money than you can even count on two, three, four hands. And, if you don’t have a money mentor, you’re really not going to explore those probably as deeply as you should. You had a list on one of your shows the other day about real estate and the guy that was talking about some different real estate options that really I had never thought of, and so, I thought that guy was a great guest on your show. But those are the kind of things you’re looking for is a money mentor that can help you explore different ways and different things to do with your money other than just getting tunnel vision on the stock market. Tim Mullooly: Yeah. Yeah. I totally agree. You need someone to kind of show you all the different options that are out there. And like your saying, a lot of advisors out there will just give you a blanket answer of, “Oh, you need to invest your money if you want more money.” And that’s not always the case. Sometimes you have a savings problem or you’re paying off debt inefficiently or something like that. There are other ways to grow your wealth just outside the stock market. So, I totally agree, having a mentor to kind of just open your eyes to the different number of options out there and walk you through them could definitely benefit a lot of people. Part of getting toward millionaire status and having this plan and becoming a millionaire is saving for retirement and having that money for your later years. Do you want to talk about how people can get ready for those later years and use the money that they make along the way to make sure that they’re the best years and not necessarily just the last years towards after retirement? Tony Bradshaw: So, I think the think that people got to realize is how long they’re actually going to live, right? Tony Bradshaw: And there’s a couple different ways to look at that. I really don’t like the word retirement. I actually hate the word retirement and the reason I hate it is because when you’re young, it’s too far away, and when you’re old, you’re scared to death of it because you didn’t prepare properly. I really like to take that word retirement and just strike it out of my vocabulary and create more of a “when do I get to live life the way I want to live it?” And I think that’s a much better mindset because you don’t have to put down age 65 for that, for retirement age. You can write that number in whenever you want it. I think that helps us drive towards our goals a little bit more effectively and efficiently than if we say retirement. It makes it more tangible a reality. I think everybody wants to live life the way they want to live it, whether you’re young or old, and so, it’s kind of more of a universal incentive kind of way to look at it. The other thing I would say around that is, I’ve had a lot of friends and family that honestly didn’t make it to retirement. Your retirement age right now ranges anywhere from 62-70 depending on what year you were born. If you want to draw full retirement benefits, you don’t know when you’re going to be able to retire and get full retirement benefits, you need to go check that out. Were you born, are you going to have to wait till your 70? Well, you need a different plan for that. I like to say 59 and a half is kind of my latest retirement date. The reason I say that is because you can actually start drawing from your retirement account without tax burdens on you, additional tax burdens. I like to tell people to set that as their retirement age first, and if they can move it up or down, then they have that option. But my mother passed away at age 67. My mother in law passed away at age 70. If they waited till their retirement age, but they didn’t get a lot of good retirement years in. I had a former boss that I had worked with, he actually, without going into too much detail, he found out he had cancer and he’s dead six months later, and he was age 65, I believe. Those are very unfortunate circumstances, but if they were following the traditional mindset of retirement, they didn’t get a lot of retirement years in, even though the average age of Americans, I think for men it’s 82. For women I think it’s 85 or 87. Those are the average years, and a lot of times, we don’t get to get to that age. Let’s figure out how to live life better and more fulfilling at an earlier date. The best thing I could say to that is, you got to have a plan, obviously. But being real intentional about it, as we talked about the 15% retirement. I don’t like the percentage number, I like absolute numbers, because absolute numbers, you get absolute results. When you think about a budget, I break my budget down in a different way. I always have. Is, I like to break it down into the living money, which is what does it take for me to live on on a daily basis? That number, you want to make that number pretty much as low as you can. Is that your house payment? Is that your apartment rent? Is that your insurance? Is that your food budget? Whatever those number are, those things you have to do to live on and exist, water bill, electricity, car insurance, get those things as low as you can. Then your next bucket is what I call wealth money. That’s the number where I want you to make that number as big as possible. I want that number to be as high as possible every month that you can put into that wealth money bucket because then I can accelerate how much I can hit that millionaire goal and then blow through that millionaire goal onto that two millionaire goal or three million dollars to get to a real number that can give you a very wealthy style of living. And these sound like pretty radical thoughts, right, when you go, “Oh man, I put $40000 away into retirement.” Once you start putting that number into a wealth plan or a millionaire plan, and you start working all those numbers together, you start to realize what the real potential for your life is. Things start to change and that’s where you start developing a vision and a dream for your life. You get out of this, what we’re trained to do since we’re kids, go get your J-O-B, and just kind of exist. Tony Bradshaw: Unfortunately, that’s where my parents … And I don’t want to sound like I’m trashing them, because I’m not, because that’s what they were brought up in and that’s what they were taught. Tony Bradshaw: So, they just weren’t able to break free from that mindset. I really want you change your financial mindset. Those are the big pillars for me, is that, change your financial mindset, stop thinking small, think big, and then figure out how to do it. The more you think about that, at first it’s going to be hard, because it’s like exercising a muscle you don’t have. Tony Bradshaw: You need to start exercising that muscle a little bit, that muscle gets a little bit stronger, a little bit stronger, a little bit stronger. And maybe the first year, if you’re stuck in that lower income mindset, you might not be able to have a total breakthrough at first, but then the more you think about and what you learn, things are going to start to change, things are going to start shifting for you. Tony Bradshaw: Colonel Sanders, KFC, the guy started KFC when he was like 67 years old. Tony Bradshaw: He was at the end of his life by a lot of people’s standards, but he built one of the biggest fast food franchises in the world and man, he was just getting started, you know? After a lifetime of failures and blowing things up, he was just getting started, so he’s an amazing story there. Don’t let your age be the thing that holds you back. Tim Mullooly: Absolutely. For me, I’m 26 years old, so a lot of people my age think, like you were saying, they hear the word retirement and they’re like, “Oh, that’s too far away. I don’t need to … or, I can’t start planning for that, or I don’t need to start planning for that.” But I like what you said about striking that word from your vocabulary and using what you were saying, when you can live life the way you want to live it? I think that that makes it a much more, you can see that goal even as a young person. It’s much closer to you and it’s not as far away as retirement. I definitely think that that’s a, like you’re saying, change your mindset, and that could definitely help young and old people. Tony Bradshaw: Yeah. And just piggy backing on what you’re saying there, when I was 25 and putting my millionaire plan together, it was a pretty simple concept. I mean, I was 90 days into this thing, learning about money, and my goal was really to be a millionaire by the time I was 40 years old. And I was … the thing I learned, so I didn’t play … My plan didn’t actually play out in the way that I expected it to, I still hit my goal. I had six kids along the way. I had to adjust for that. Tony Bradshaw: A million dollars is not enough to really help me live life the way that I want to, but it’s a lot closer, my vision to change. But it was a lot closer to where I wanted … for me, it’s just a first milestone along that journey. Tim Mullooly: You know, there a lot of different keys and traits and tips and useful pieces of information within the book that readers can take with them. But, if you could pick just one thing from the book that you wanted readers to take away, what would that be for you? Tony Bradshaw: Well, can I request two? Tim Mullooly: Sure. I’ll allow it. I’ll allow it. Tony Bradshaw: I think the first one is become a lifelong student of money. You got to get money smart, you got to learn. So, whether that’s learning on your own or learning from a mentor, learning from a Living With Money podcast that you do, that is probably one of the biggest things. The next one I would add onto that, is take what you learn and apply it. It’s not enough just to learn it. You have to apply it through a plan. You have to package it all together in the right way to accomplish a goal. That’s why I really want to push this concept with the book, and I think that’s what makes my book unique compared to a lot of other financial books in the marketplace, is that you have to establish your own millionaire plan. Whatever your circumstances are in life, you need to take what your life consists of and you need to package it in a way that you know what that date is when you’re going to become a millionaire. Whether it’s a 20 year goal or 30 year goal or 10 year goal, there is a date that you will become a millionaire if you apply that knowledge that you learn in the right way, and you’ll cross that threshold. It’s inevitable that you will cross that threshold. Tim Mullooly: Awesome. Yeah. And those two work perfectly hand in hand. For the listeners out there, we’re going to link in the show notes to where you can pick up a copy of the book as well. Tony, I’ve got one last question for you. I like to ask every guest before I let them go. What’s been one piece of advice, be it personal or professional, or both, one piece of advice that’s always stuck with you? Tony Bradshaw: This is a very interesting question, because we always know we can go on forever about everything we’ve learned or people have told us, because there’s so much good information. I have to come back to one thing and it’s really two things wrapped in one, is listening. You have to listen to the people you’re talking to and the people that are in your circles to make sure that good communication is happening. Whether you’re at work or you’re at home with your wife or working with your kids, I think it’s so easy for us to hear what people are saying and we process it through our own filters and a lot of times miscommunications happens because we don’t listen well enough. We think we understand what somebody’s trying to say to us, but we’re really kind of lazy. Even in my professional career, a lot of problems that I had seen kind of crop up in executive meetings or my own leadership, really all pointed back to people not listening and good communication not effectively happening. Whether it was at work or home, the problem existed in most places and the harder I’ve worked to listen to what people are saying to me, the harder I’ve worked to make sure that good communication happens between who I’m talking to and who I’m listening to, the better everything has gone. That’s the best advice I could give anybody. Tim Mullooly: Absolutely. I could not agree more and that, like you said, stretches over both personal relationships and professional relationships as well, so great advice there. That’s going to wrap up all the questions that I had for you today Tony. Thanks for coming on the podcast. I really appreciate it. Tony Bradshaw: Yeah Tim. I really appreciate it too. Thanks for having me and giving me an outlet to kind of share my book and my thoughts. Tim Mullooly: Of course. Any time. Again, for the listeners, we’re going to link in the show notes to the website where you can find Tony’s book, The Millionaire Choice. That’s going to do it for this episode of Living with Money and we will see you on the next one.